Today is a day that's close to my heart…it's World Diabetes Day! Please remember all of those who suffer from this devastating illness - & the bravery & fortitude they show in battling it every minute of every day. Of course, I am most proud of Annalise, & am in awe of the grace she displays in dealing with the cards that she's been dealt. Here's to her - & all of the others that face each day with the uncertainty of where this illness may lead. Hang in there one & all…I truly believe in my soul that there WILL be a cure found in your lifetime! And a BIG thank you to all of those in Annalise's life who have helped her, supported her, & have stuck by her side during the ups & downs that Type 1 Diabetes can bring. I know that it can sometimes be difficult to hang in there, and I thank you from the bottom of my heart. You have NO IDEA how much it means to Annalise - & to all of us. Fingers crossed that our meeting will help to move this law in the right direction. Another Meeting with NY State Lawmakers! April 28, 2014 - Huntington H.S. Sophomore, Annalise Mozer, was once again invited to NY's State Capitol in Albany by the American Diabetes Association, to join their delegation to advocate/lobby for Senate Bill 4473* - the "Safe At School Diabetes Care Bill." The delegation consisted of 2 teams of 8 members each, covering meetings with 18 Senators & Assembly Members. Annalise was part of the "downstate team," which held 9 separate 1/2-hour meetings with lawmakers, with the hope of getting the "Safe At School School Diabetes Care Bill" closer to becoming law. The ADA's delegation was once again led by it's Northeast & Carolina's Advocacy Director, Stephen Habbe. Mr. Habbe was happy to have Annalise as part of the team again, for this - her third - visit, & reminded her of what an honor it is for someone so young to have this rare & important opportunity. The day's agenda was fast-paced & exhausting, but well-worth everyone's efforts. Included among the Senators & Assembly Members with whom Ms. Mozer & the delegation met were Sen. John Flanagan (Chair of the Senate Education Committee), Sen. David Valesky (Member of the Education & Higher Education Committees), & Assemblywoman Catherine Nolan (Chair of the Assembly Education Committee). As Mr. Habbe said after the meetings, "We have some challenges ahead of us...but also are seeing some understanding and hopefully a degree of consensus about the self-management issues, which is definitely good! We’ll keep working on this to see what we can get done." Ms. Mozer was thrilled to once again play such an integral role in this very important work - & is willing to go back to NY State's lawmakers as many times as it will take to get this bill moving in the right direction! Said Ms. Mozer of her experience, "I feel so incredibly honored to have been asked again by the ADA to be part of their delegation. I am fully committed to this effort, & will be happy to be a part of the ADA's future advocacy trips to our State's Capitol." Annalise is truly grateful to have had yet another opportunity to be a part of this meaningful cause, & hopes that her presence in Albany - along with everyone else in the delegation - helped to make a real difference. 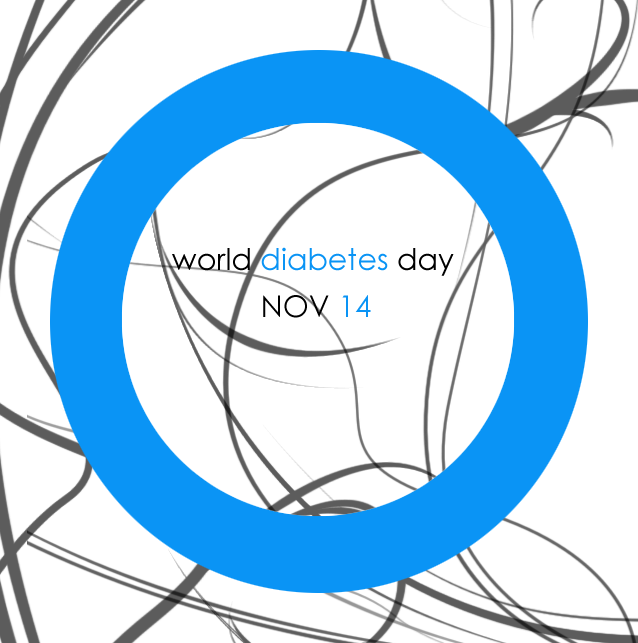 November 13, 2013 - Tomorrow is World Diabetes Day. (November 14, 2013) It is celebrated every year on November 14th & is a campaign led by the International Diabetes Federation (IDF) and its member associations. It engages millions of people worldwide in diabetes advocacy and awareness. The global diabetes community - including International Diabetes Federation member associations, diabetes organizations, NGOs, health departments, civil society, individuals, and companies - develop an extensive range of activities, tailored to a variety of groups. The most visible of these activities is the lighting of public buildings & spaces in blue, around the globe - to mark this occasion. 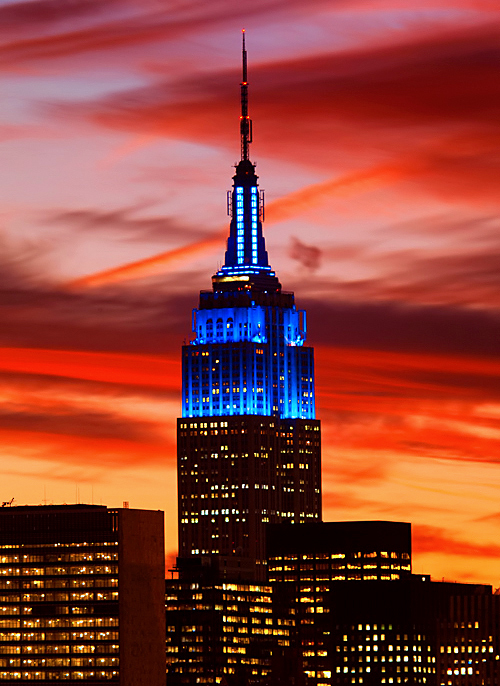 The Empire State Building in New York, is one of the most spectacular & celebrated buildings to don blue lights every year on November 14th. The circle occurs frequently in nature and has thus been widely employed since the dawn of humankind. It symbolizes "unity." The blue border of the circle reflects the color of the sky that unites all nations, and the flag of the United Nations. So - please be sure to send a special message & good thoughts - or give a big hug to - someone in your life who is affected by this serious illness. Thank you! Sunday, November 3, 2013 - Bethpage Ballpark, Central Islip, New York: On a brisk November morning, 18 friends gathered to support Annalise & the JDRF by walking side-by-side on her team, "2 Sweet 4 Sugar." Thank you one & all, for lending your time, support, friendship & love, to Annalise & her quest of finding a cure for Type 1 Diabetes! Your presence there meant more to us than you'll ever know. 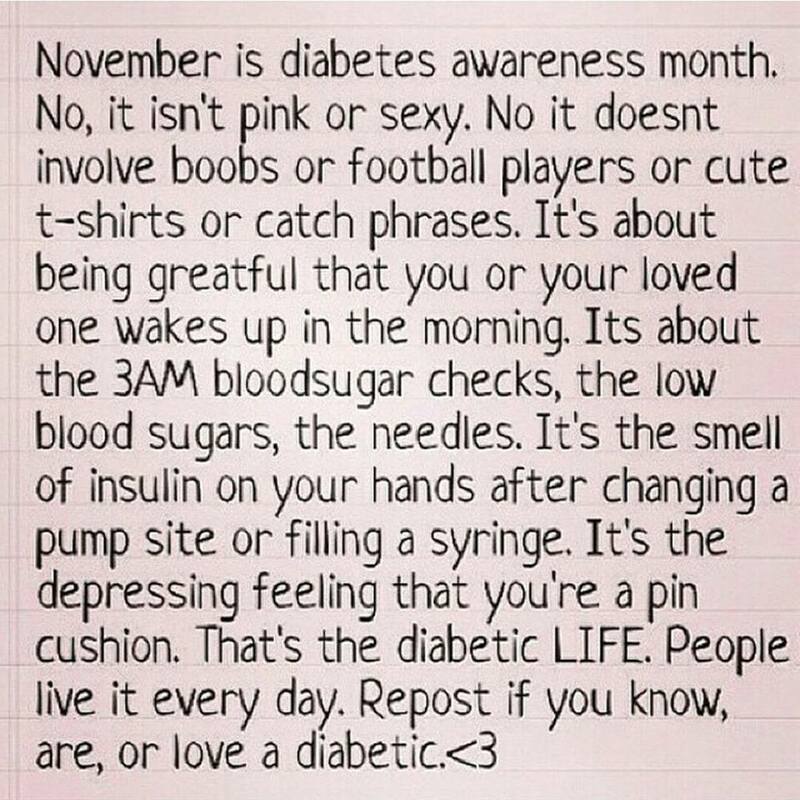 Diabetes DOES NOT Define Me! 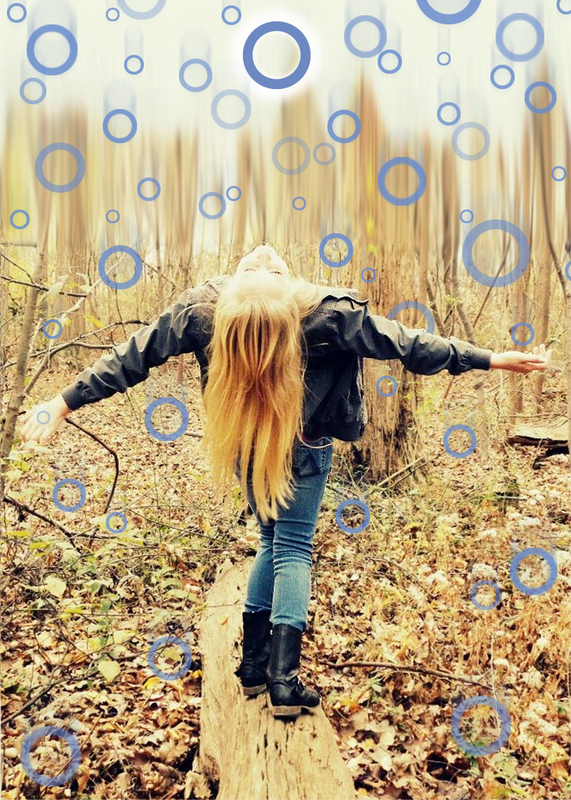 A video made by Annalise, for submission to the JDRF. The message is really terrific, & we hope you find it inspirational, as well. We sold wristbands at my middle school and raised a lot of money, which we donated to the Juvenile Diabetes Research Foundation (JDRF). Since then, I've been involved in many awareness & fundraising activities to help with this cause. Most recently, I participated in something for which I am very proud: In April of this year, I traveled to the NY State Capitol in Albany as a member of the American Diabetes Association's delegation to advocate for the passage of Senate Bill 4473: The "School Diabetes Care Bill." If passed, this legislation will help NY State's children with Type 1 Diabetes to receive better care & support while in school, & will also allow for students to self-manage their illness. Self-management is of the utmost importance to kids like me, as it reduces time spent away from the classroom, (which often results in missing important lessons & assignments - & ultimately - leads to lower grades). This year, I do have good news to report, on the progress that I've made in managing my Type 1 Diabetes: I began using an insulin pump in May, & it has made my life so much easier! Instead of having to give myself up to eight injections a day, my pump delivers my insulin to me in a much less invasive way. I still have to prick my fingers to check my blood sugar approximately 10 times a day, but that's much less than the 20 times/day that I had to before I began using my Omnipod pump. This type of life-changing progress is made possible as the direct result of donations going into the research that fuels these medical advances…which is why joining the JDRF ‘s Walk to Cure Diabetes is so important to me - & everyone else like me - who has to deal with Type 1 Diabetes every, single day. The JDRF is the leading global organization funding Type 1 Diabetes (T1D) research. Its goal is to progressively remove the impact of T1D from people’s lives, until we achieve a world without T1D. All money donated to the JDRF goes directly to the research that develops the medical advances & miracles that will someday make our world T1D free! Once on the homepage, scroll down to "Walk to Cure Diabetes." After clicking on that link, click "Register," & input "NY." Also click on "Donate to a Walker" & put-in my name: Annalise Mozer, my team name: 2 Sweet 4 Sugar, & the state again: New York. After you've done all of that, you'll be directed to my specific walk information. Thank you for your consideration. I hope to see you on November 3rd at Bethpage Ballpark in Central Islip, on Long Island - at around 9:00am. I hope that you will do me the honor & join my team – "2 Sweet 4 Sugar" - as we walk together towards a cure! The 2013 JDRF Walk to Cure Diabetes! On Sunday, November 3rd, I will be walking with my team - "2 Sweet 4 Sugar" - at the JDRF's 2013 "Walk to Cure Diabetes." Please join us as we raise money to help find a cure for Type 1 Diabetes. FYI - if you can't actually physically be there with us, you can join us as a "virtual walker." Just click on the link above, for more details. Thank you! We hope to see you on November 3rd, as we walk towards a cure for Type 1 Diabetes! 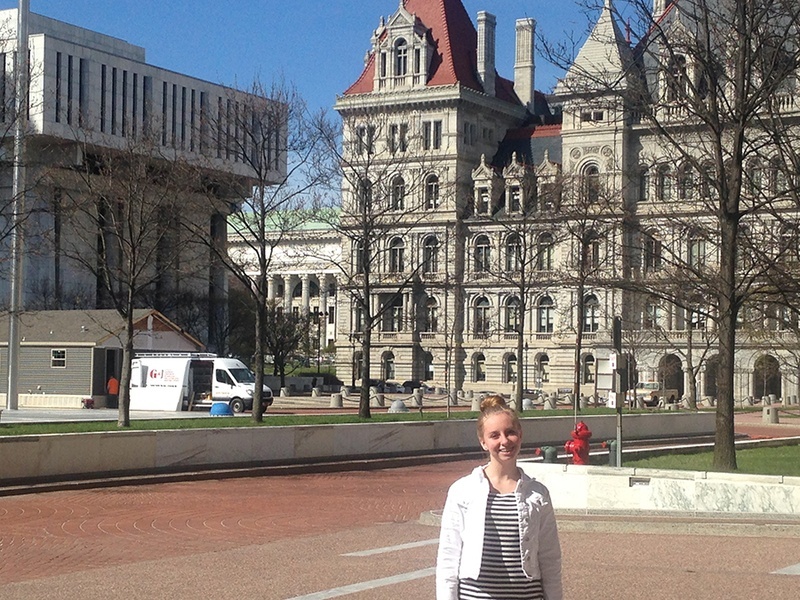 April 30, 2013 - Huntington High School freshman, Annalise Mozer, recently had an amazing opportunity rarely afforded kids her age: On Tuesday, April 30th, Miss Mozer traveled to the New York State Capitol in Albany, as part of a delegation led by the American Diabetes Association. Included in the delegation were the advocacy director for the ADA, an endocrinologist specializing in diabetes care, two nurses certified as diabetes care educators, and three parents of children with Type 1 Diabetes. Annalise was invited by the ADA to be a member of the delegation to lend her personal perspective, in order to help advocate for the passage of Senate Bill 4473 - the "School Diabetes Care Bill." This legislation was filed by Senator Carl Marcellino, and is co-sponsored by Assemblyman Michael Benedetto. 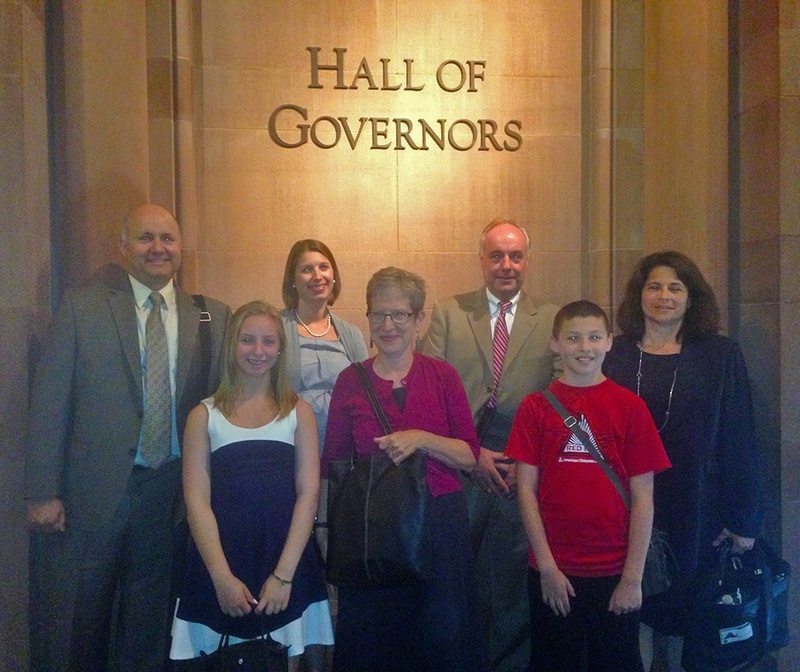 Senate Bill 4473 is an act to amend NY State education law in relation to care for pupils with Type 1 Diabetes. The bill supports NY State's children with diabetes, by allowing school staff to volunteer to be trained to supplement care provided by the school nurse, on those occasions when the nurse cannot be present (such as with extended day programs or on field trips). Bill 4473 also ensures that students who are capable of self-managing their diabetes be allowed to do so while in school, with the permission of their parents and clinician. Authorizing self-management is of paramount importance, as it would allow for more responsive, timely diabetes care, which would result in taking less time away from the classroom and overall academic studies. Although NY State does not currently have a law supporting this premise, 30 other states across the country have already adopted this type of legislation. While in Albany, the delegation - led by Stephen Habbe - had a very full schedule. They met with nine Senators and Assemblymen/women, in a fast-paced four and a half hour time-frame. Two of those meetings were held with the top two NY State Education Committee Chairpersons: Senator John Flanagan - Senate Education Committee Chair, and Assemblywoman Catherine Nolan - Assembly Education Committee Chair. During the delegation's meeting with Senator Flanagan, he was particularly interested in what Annalise had to say, and spent most of the allotted time speaking with and questioning Annalise directly about her personal experiences and views on these issues. "It was an intense and extremely busy day, but one that was well worth our time. It seemed that the Senators and Assemblymen/women with whom we met had a positive response to our advocacy efforts." said Miss Mozer. "I was so proud to be a part of such an important cause…it made me feel like my presence there was making a real difference!" 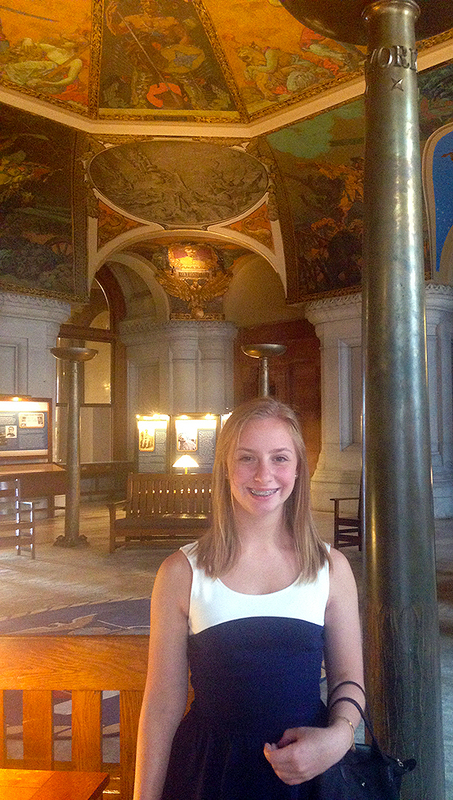 In addition to the nine scheduled meetings, Annalise was invited on a private tour of both the Senate and Assembly chambers, while they were in session - and even got a peek at Governor Cuomo's offices. Miss Mozer also had the extreme honor of being personally invited up to the dais of the Senate chambers, by Senator Carl Marcellino, co-sponsor of the "School Diabetes Care Bill." She was especially thrilled when Senator Marcellino handed her the official NY State Senate gavel, for a once-in-a-lifetime photo op. “It was a pleasure to meet Annalise in Albany and have her advocate for the legislation that I am sponsoring. Together we can continue to keep fighting to secure better outcomes for students that are living with diabetes, and stop creating needless barriers to students who independently and appropriately manage their care. I look forward to the passage of this legislation, so we can lessen the impact that diabetes has on our students,” said Senator Carl L. Marcellino. All in all, Annalise's "Excellent Albany Adventure" was a great success! "The hands-on education that Annalise got from this opportunity was immeasurable, and the introduction to our state's legislative process was a priceless learning experience. It was a day that I'm sure she'll never forget, and will look back on with great pride," said Annalise's mother, Liz Mozer. "I was truly in awe of everything that I had the privilege to see, do, and learn," said Annalise. "To be right there in the heart of where our state's laws are made - and to quite possibly have made a difference - was an extraordinary, energizing, and inspiring experience!"